Korea is a splendid countryside during the season of autumn as the trees change into vibrant yellow, red orange and brown. Autumn is the most pleasant time of the year in which the entire peninsula is painted with golden ginkgoes, coppery-orange zelkovas and red maple trees under the crisp blue sky along with the breeze of a cool weather. Splendid season of autumn in Korea. Many Koreans are looking forward to this beautiful season and spend time with their friends, loved ones and family outdoors. A casual visit in the royal palaces of Korea, picnic bonding at nearby city park, and or hiking in one of the country’s famous summits are only few of the exciting activities everyone can enjoy especially during the peak of the fall foliage. Hyangwonjeong Pavilion is a magnificent spectacle in the fall set on an artificial island in a lake inside the grand Gyeongbok Palace of Korea. Downtown the capital city of Seoul, the ‘Five Grand Palaces of Korea’ which were built during the period of the Joseon Dynasty are great destinations to witness the season’s colorful transformation as they are just majestic in fall. 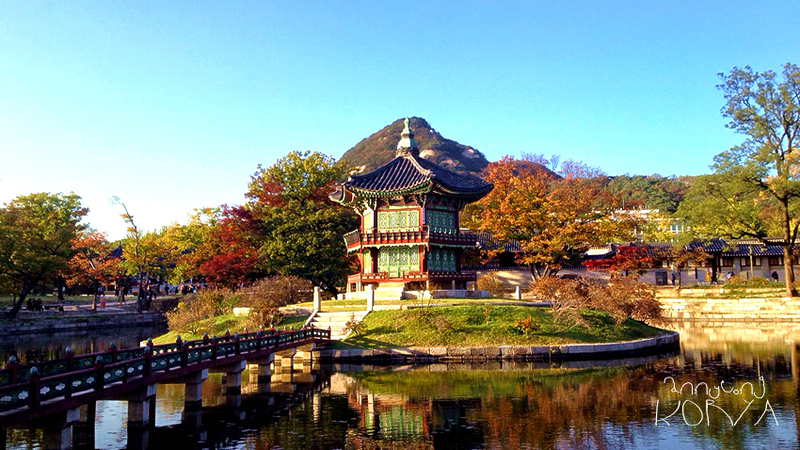 Gyeongbokgung Palace’s grandeur is even more fascinating in shades of red, orange and gold tinted landscapes. The brick walled road leading to the Deoksugung Palace ornamented with tall ginkgo trees glow in hues of golden yellow, same goes with the tranquil lotus pond of the Changdeokgung Palace adorned with fallen autumnal leaves alongside the royal garden of Huwon, and the prominent Korean Folk Village which is as well stunning during the fall season charm many artists, photographers and tourists. Similarly, a walk and forest bath in country parks near the Han River and in Seoul Grand Park are yet another activities to be with nature set in the bustling city while enjoying the scent of the autumn trees. 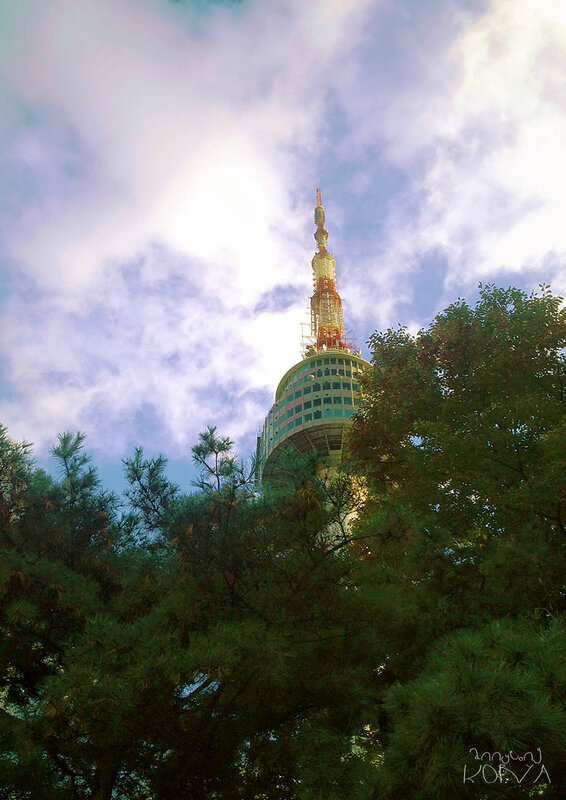 The iconic N-Seoul Tower peeping between the tall pine trees at the peak of Mt. Namsan. Mt. 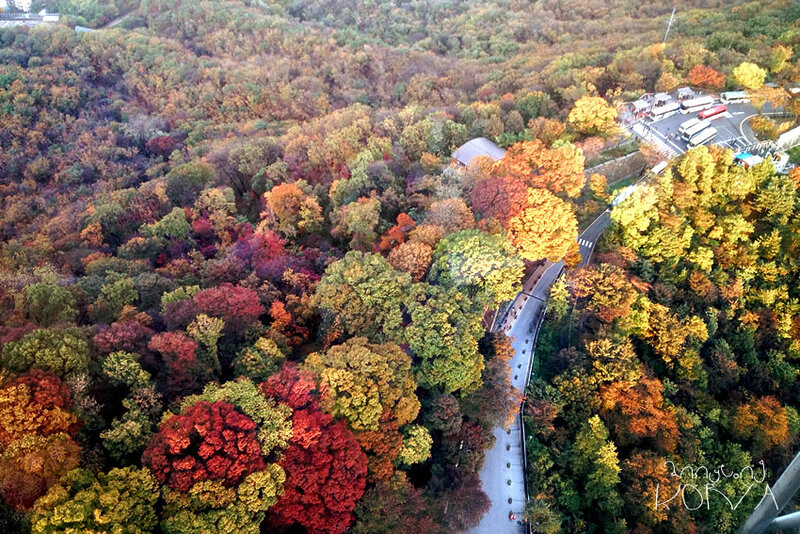 Namsan’s nature park in full autumn colours. Autumn in Korea isn’t only about the time of falling leaves but also a season of bountiful harvests. Hectares of rice fields turned into tints of gold while many fruits like jujubes, apples, pears, and persimmons, which are symbols of the season, are all ripening which adds rich color to the foliage. 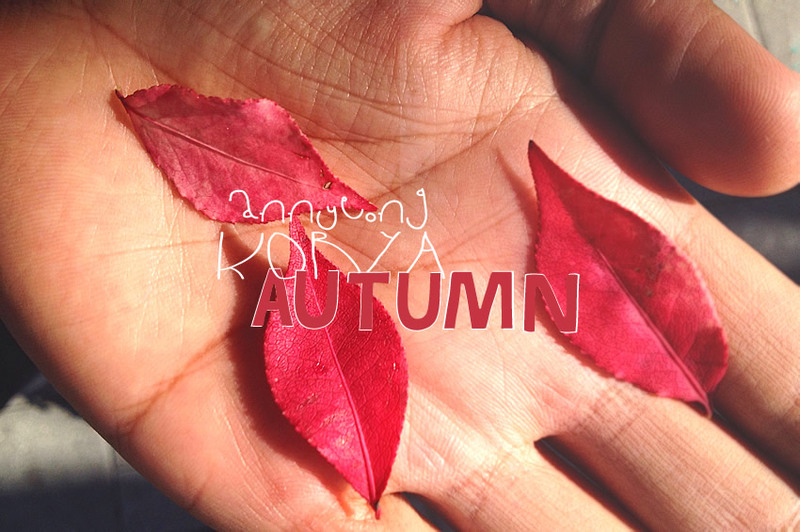 Another reason to enjoy Korea’s wonderful season of autumn is the many festivals and holidays. Chuseok, as one of these exciting festivities, is an annual traditional holiday and a major harvest festival that every Korean home celebrates to offer thanksgiving and pay respect to their ancestors. The season’s biggest custom, which is held around the autumn equinox, is also a feast of Korean traditional food and beverages such as the representative food songpyeon rice cakes, hangwa confectioneries and sindoju rice wine, not to mention, the roasted chestnuts, ginko nuts and seasonal sweet pancake hotteok filled with mixed nuts. Chuseok holiday is as well a celebration of old traditional games including the arrow throw tuho, seesaw neolttwigi, Korean wrestling ssireum and archery along with the folk dance ganggangsullae. Moreover, another reason why autumn is an exciting season in Korea is the kimchi-centered festival Kimjang. It’s the traditional way of making the all-time favorite kimchi wherein the whole community gather in group to prepare and make the famous fermented dish. Kimchi made in the fall is said to be the best kimchi to serve throughout the year. 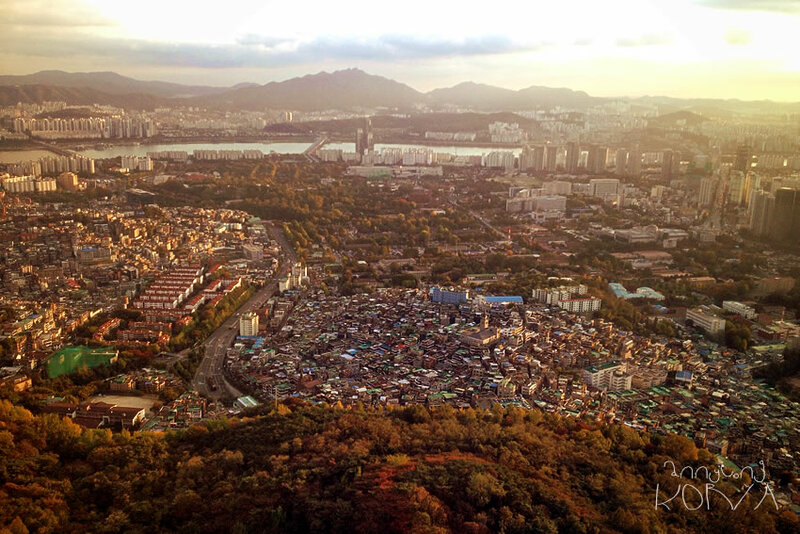 Scenic view of Korea’s capital city during the inviting season of autumn. Autumn festivities such as the Andong Maskdance Festival which features the folk dance heritage and cultural mask dances of Korea and the Suncheon Bay Reeds Festival which naturally showcases the charming fields of brown reeds which home to rare birds and other wildlife is as well a great idea to include them up in your travel bucketlist. Besides, there’s also the much-awaited celebation of Seoul Lantern Festival which lights up downtown Seoul to a glistening paradise, particularly the Cheonggyecheon Stream, with hundreds of colorful, uniquely designed and well-lit lanterns. Autumn in Korea is without doubt a magnificent spectacle which you can enjoy from mid of September until late of November. But then again whichever season you choose to travel to, whether in winter, spring and summer, you will definitely going to have a great time exploring the inviting countryside of Korea all year round. I'm Jap. 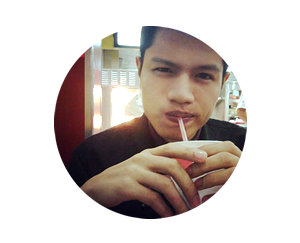 The geek behind this Korea centered travel blog. 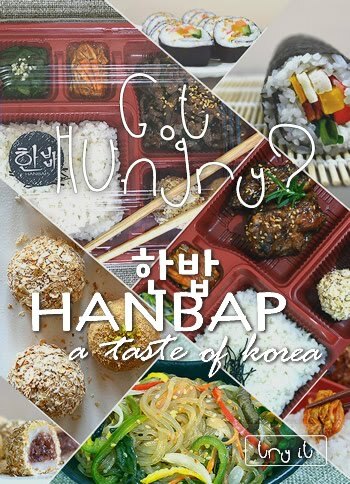 Come along with me as I map the inviting countryside of Korea, try [even cook] delicious Han food and experience the best of Korean culture. Gajaaa, let's discover Korea beyond kimchi!